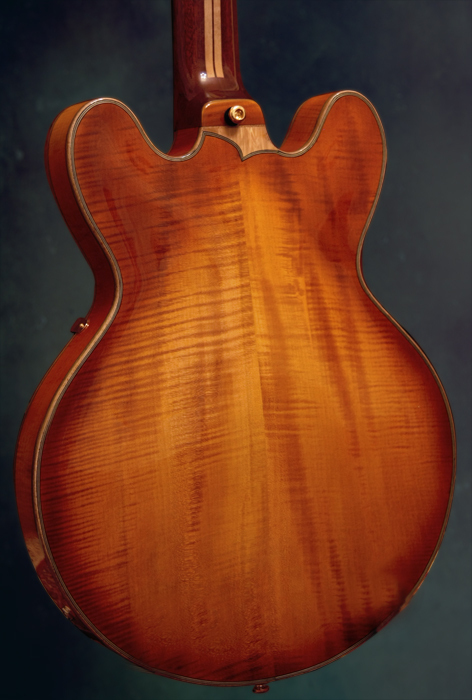 Shape: Full solid body archtop guitar with double cutway in 335 style. Body width is 15.3", depth is 1.75 ". Soundboard: Parallel braced soundboard with extra tremolo braces . Mid size custom shaped F holes. Back: Hand carved "book matched" master grade maple. Neck: 5 piece of mahogany and curly maple. Fingerboard is ebony with ebony binding. Peghead veneer is ebony on the front and curly maple at the rear side. Neck meets the body at the 19th. fret. Neck profile is "soft D ". A double way truss rod nut is under head veneer. Frets are "medium" size. 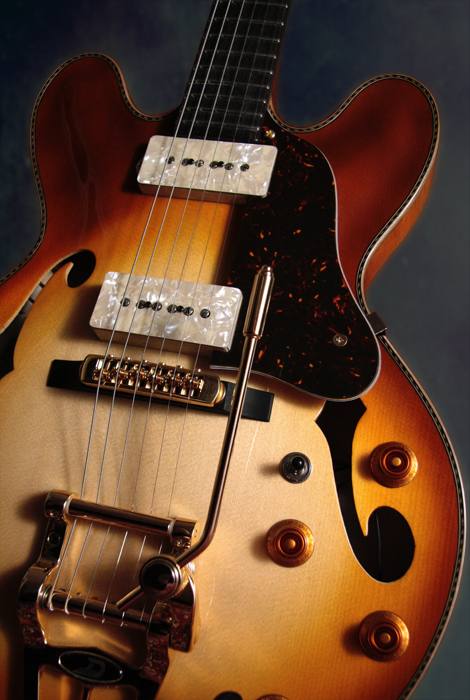 Other: Binding is combination of walnut, maple and ebony and bridge is ebony with adjustable "Schaller roller bridge". All inlays and fancies are mother of pearl, abalone and ebony. Pickups - pair of Gibson's stack P100 in custom pearl covers. 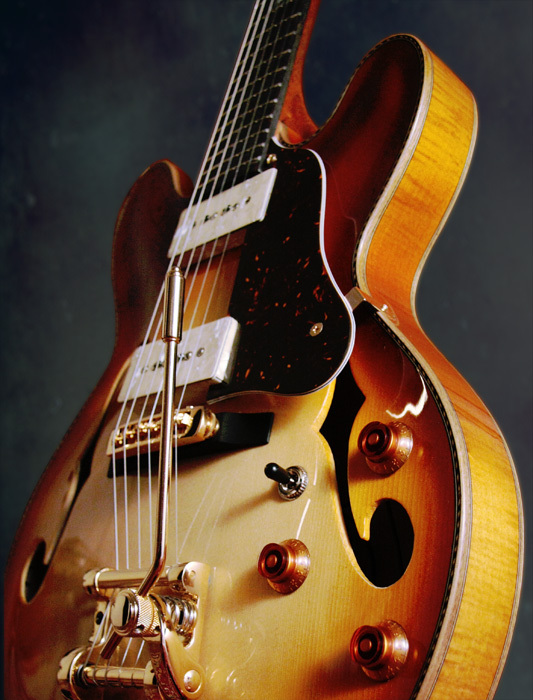 Two volume controls and two custom tone controls with special capacitor value for each pickup. 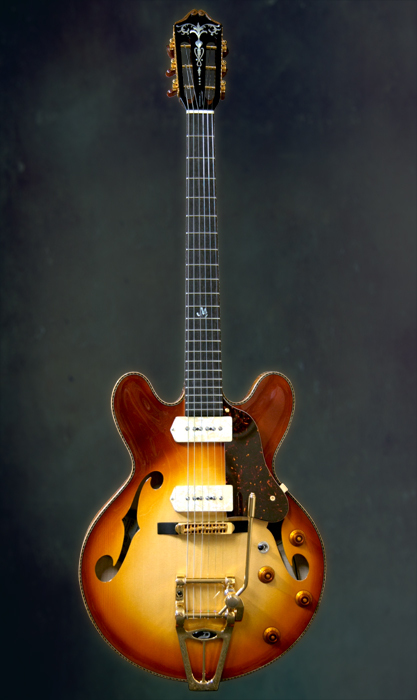 Sound: Almost full body sounding archtop guitar with all acoustic responses at the whole sound spectrum.